Director of rugby Bryan Redpath is backing fly-half Danny Cipriani to improve as he settles at Sale. 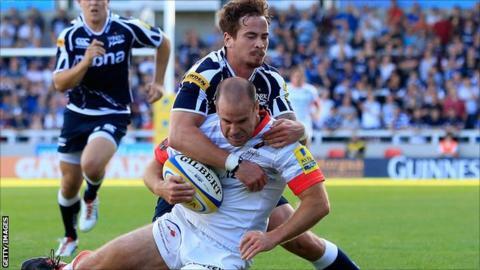 Having come on as a replacement in the opening Premiership match at Exeter, Cipriani made his first start for the Sharks against Saracens on Saturday. Redpath told BBC Radio Manchester: "You can see he needs more time with the players, just so people can read him. "He's a threat and a talented player. The more he plays, the better he'll get and it was a good start for him." Cipriani returned to the English game in the summer after two years playing in Australia for Melbourne Rebels. Sale have lost their first two matches, including to Saracens in their first competitive outing at their new home, the Salford City Stadium. Redpath has said he wants to make it a difficult place for opposition teams to play, although he concedes that will take time. "We've only trained there three or four times because the rugby league team [Salford City Reds] have still been playing and training there," said the former Scotland international scrum-half. "At the moment, it's not an advantage for us because it's new for everyone, for people coming here as much as it is for us. "Over the next few weeks, we can get train more here and get used to it."